I am super excited to bring you this fabulous linky and although it is technically link up number 8, it is still my first one so I would love you to join in with us! The lovely Toni from This Mama and I have joined forces to bring you a fabulous weekly food link up – it can be any food type blog posts, such as recipes, meal plans, restaurant reviews, literally anything food wise is welcome! For anyone that doesn’t know what a linky is, a linky or link party is for a group of bloggers to share like minded posts. It’s great for fellow bloggers as they can share their favourite posts with more people but it’s also great for our readers as they get to see a wider range of posts from one place, so win win. Everyone knows I am a huge foodie and even had the fortune of getting a book published which is available on Amazon – it was in the top 100 for a long time too which I am super proud of! I love sharing foodie tutorials on my blog and even create large family friendly meals too. Since I joined Slimming World I have been meaning to create a section for those low calorie but super filling meals I have been creating so this could give me the shove in that direction too. 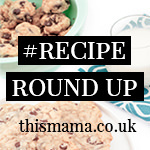 Feel free to link up two of your posts, old or new that feature anything food related such as recipes, goodies you’ve baked, even ones you’ve linked before if you think they need a little extra exposure. It can be something as simple as a quick mid week meal or a special birthday cake you made, basically anything that is food related. #LittleLoves Week 17 – 2nd June 2017!